January 15 (AAStocks) SOUTHGOBI-S (01878.HK) announced its operating results for the fourth quarter of 2014. Its raw coal production dropped 87.9% yearly to 0.21 million tons; sales volume was 0.37 million tons, down 78.5% from the same period of last year. For the whole year of 2014, raw coal production declined 49% year-on-year to 1.56 million tons; sales volume shrank 37.4% to 2.04 million tons. The company said the furlough for approximately half of the company's workforce remains in place subject to market conditions. HONG KONG, CHINA--(Marketwired - Jan. 15, 2015) - SouthGobi Resources Ltd. (TSX:SGQ)(HKSE:1878) (the "Company" or "SouthGobi") today announced select fourth quarter 2014 operating results. All figures are in U.S. Dollars unless otherwise stated. There continues to be uncertainty in respect of the timing of the release of restricted cash held in Mongolia as a result of the ongoing tax investigation case. Therefore the cash and cash equivalents balance as at December 31, 2014 and September 30, 2014 does not include restricted cash held in Mongolia of $1.2 million and $1.5 million, respectively. Restricted cash is classified within current assets in the Company's financial statements. As at January 15, 2015, the Company had a cash balance of $4.5 million which excluded the $1.2 million restricted cash. Ulaanbaatar, January 16 (MONTSAME) The State General Prosecutor's Office (SGPO) called a press conference on Friday to inform the public about the tax avoidance cases regarding "SouthGobi Sands" LLC, a branch of Canadian-listed SouthGobi Resources Ltd. in Mongolia. The news conference was called by Mr T.Sukhbaatar, head of the SGPO's Press and Public Relations Division; and Ms G.Gereltuya, an attorney of the Municipal Prosecutors' Office. A case was opened by the Corruption Combating Agency (CCA) in 2012 regarding the group of officials led by D.Batkhuyag, then-head of the Authority for Mineral Resources. During the investigation, an investigator and commissioner O.Barkhasbadi separated a criminal case involving a US citizen Justin Kapla, who was the president of SouthGobi Sands at that time. He has since been under investigation on the grounds of tax evasion with a value of MNT 17 billion 441 million 383 thousand and 600 payable for MNT 90 billion income of the company, by intentionally presenting added value of taxable income expenditure, thus reflecting an omitted value of taxable revenue into the 2011 financial report of the company, with assistance from a former colleague at SouthGobi, a Phillipine national Hilarium Cajucom, the general manager at that time. Another investigation has taken place regarding a separate tax evasion of MNT 17 billion committed by Hilarium Cojacum and Cristobal David, who then worked as a manager in charge of finance and accounting of SouthGobi, both Philippine nationals. A group of criminal experts issued a conclusion on December 16, 2014, that confirmed the validity of these cases of significant amount of tax evasions, which imposed tax deficit of over 35 billion Togrog. The cases have been passed to the primary court. Travel bans for the accused persons have been issued during the investigation, and the SouthGobi accounts in Khan Bank, Golomt Bank and Trade Development Bank have been sealed, said T.Sukhbaatar. The case has been the biggest ever taxation avoidance crime in Mongolia in terms of amount of money. January 15 (Stafford Daily) Turquoise Hill Resources Ltd (NYSE:TRQ) reported a drop of 4% or 1,048,788 shares in its short interest. The short figure came in at 2.7% of the total floats. The average daily volume of 2,527,787 shares suggests that the days to cover 25,236,244 short positions, as on December 31,2014, will be 10. On December 15,2014, the short interest was 26,285,032 shares. Shares of Turquoise Hill Resources Ltd (NYSE:TRQ) ended the trading session with a loss of 0.07 points or 2.52% at $2.71. The shares had previously closed at $2.78. Heavy selling had caused the price to collapse to $2.65 intraday but value-buying helped the shares pare some of the losses; however the shares dipped into the negative territory by end of the day. This is an interesting bullish sign which implies that investors are willing to buy on the dips. The session witnessed a volume of 3,892,304 shares. Turquoise Hill Resources Ltd (NYSE:TRQ) has a market cap of $5,453 million and the number of outstanding shares is 2,012,299,000. The shares have a 52-week high of $4.36. Turquoise Hill Resources Ltd., formerly Ivanhoe Mines Ltd. is an international mineral exploration and development company. The Companys principal mineral resource property is the Oyu Tolgoi Project, located in Mongolia. The Company also has two subsidiaries, through which it holds interests in coal resource properties in Mongolia and molybdenum, rhenium, copper, gold and uranium resource properties in Australia. Its subsidiary, SouthGobi Resources Ltd. (SGQ), owns and operates the Ovoot Tolgoi Coal Project located in Mongolia. Its subsidiary, Ivanhoe Australia Limited (Ivanhoe Australia), owns the Osborne Project, the Merlin Project and the Mount Dore Project, all of which are located in Queensland, Australia. In November 2013, Turquoise Hill Resources announced that it has completed the divestment of its interest in Inova Resources Limited (Inova) to Shanxi Donghui Coal Coking & Chemicals Group Co., Ltd.
January 15 (GuruFocus) The stock of Mongolia Growth Group has been under pressure over the last several months. Consequently, this created lots of questions from the current and potential investors. Here is an interview with Harris Kupperman, CEO of Mongolia Growth Group. Also, the company released an update on January 14, 2015. I will be including Mongolia Growth Group in the February Issue of Ultimate Value Finder. Mariusz Skonieczny: Lots of things have changed since we talked last time and also lots of things have changed since MGG went public. I remember when I first learned about the company, the Mongolian economy was on fire. Lots of people were talking about it. However, recently people are not excited about the Mongolian economy and I am sure this some consequences on MGG. We will get to the details of MGG, but can you update us on what is going on with the Mongolian economy? Harris Kupperman: When I first started MGG, I believed that Mongolia's $2 trillion in resource wealth would ultimately come out of the ground and make Mongolia into a very wealthy place. I also knew that this wouldn't be a seamless process and that there would be plenty of volatility along the way. In summary, we are witnessing some of that volatility today. This is partly the result of lower coal prices, but the government has also made a number of critical mistakes in regards to foreign investment and that has discouraged investors. The good news is that this is all fixable. Furthermore, many frontier markets have made similar mistakes, recovered from them and then come out stronger. This is all part of a country maturing. Mariusz Skonieczny: Because the Mongolian economy is so small in relation to the economies of other countries, single projects like the Cooper/Gold Oyu Tolgoi mine can by themselves grow the country's GDP. From my understanding, the government of Mongolia and Rio Tinto are fighting over tax issues related to the project. Do you think that this disagreement has negative consequences on foreign investment in Mongolia? Harris Kupperman: The disagreements between the Government of Mongolia and Rio Tinto over the Oyu Tolgoi mine are probably the largest single deterrence to foreign investment. Everyone knows that this will ultimately be resolved, but until it is, many large projects are on hold. Mariusz Skonieczny: What is the status of the disagreement between Mongolian government and Rio Tinto? Harris Kupperman: There are many issues, some are economic issues and some are simply related to egos. The biggest issue is that the project is over budget and Mongolia won't be getting dividends until the project recoups its capital costs. The Mongolians want to understand why the project is so over budget and make sure that it won't go even further over budget. In the end, this will get resolved—it is just a question of when. Mariusz Skonieczny: Do you think once the conflict over tax issues is resolved, that foreign investment in Mongolia will recover? Harris Kupperman: I think it will take some time for foreign investment to recover to prior levels. However, you want to be positioned for the eventual resolution as asset prices will jump substantially as soon as the resolution is finalized. We saw the same thing happen when the original stability agreement to develop the mine was signed. In the months after the announcement, asset prices increased by hundreds of percent—the MSE 20, the best benchmark for Mongolian asset prices increased by about six-fold in less than two years. No one will want to miss that sort of move. Mariusz Skonieczny: Now, let's move on to MGG. Last time we spoke, you hired a new CEO that had a plan to transform MGG into a CB Richard Ellis of Mongolia. He wanted to do a private REIT, development arm, etc. According to the most recent news from the company, the CEO is gone, several board members are gone, and huge cost cuts are on the table. This is obviously a completely different strategy from what was communicated to investors over the last four years. Please tell us what is going on? Harris Kupperman: I am the largest shareholder and have a huge percentage of my net worth invested in this company. After I stepped away from daily responsibilities and looked at the model, I realized that it just wouldn't work given the slow-down in the Mongolian economy. Not only were we not gaining traction with this model, but we were going backwards and adding to our costs. We should have been aggressively cutting costs and getting to cash flow positive. It's great to talk about growth initiatives—but it's much harder when investors are hesitant to invest in Mongolia. I think we will be doing many of the things that we talked about, but we need to first wait on a resolution of the Oyu Tolgoi mine dispute and an increase in foreign investment in Mongolia. I want to grow, but it needs to be from a much sounder base. Mariusz Skonieczny: Can you give us an example of things that you are doing or planning on doing to bring your cost structure to a level that the company is profitable? Harris Kupperman: A lot of it has to do with mentality. We were approaching this business like we were building a multi-billion dollar company. However, to get there, you first need to succeed at being a smaller business. This means cutting a lot of the unnecessary spending that has surrounded the company. There is just so much to cut and I've wanted to get cutting for a long time. I'm actually really excited to finally get the job done. There were impediments before, but now I'm finally free to act. Mariusz Skonieczny: Investors always want to know "when." So when do you anticipate the cost cutting initiative to be complete? Harris Kupperman: The first round of cost-cutting is mostly complete. It will take a few months for it to work its way through the system, but the key was to identify the costs and then eliminate them. This is everything from terminating contracts that serve no purpose to re-negotiating contracts. Now I'm able to take out the chainsaw and get things in line with where they need to be. There will be a second round of cuts, but this second round will take a bit longer as we are then looking at costs that are more difficult to simply eliminate. These are items that we need to re-tender and really analyze the costs and benefits of each service provider. I suspect that these costs will be much more under control by the middle of 2015. Mariusz Skonieczny: Once the company is profitable, what are you going to do with the profits? Are you going to use it to buy other properties, retail it, or pay it out through a dividend? Harris Kupperman: I think we will do a combination of the above, but there is so much opportunity in Mongolia that re-investment will be the main priority. Mariusz Skonieczny: The company recently sold some properties to focus only on the core holdings. How was the money from the sale of these properties used? Harris Kupperman: It was re-invested in Tuguldur. I believe that continuing to develop our Tuguldur asset is by far the best use of our capital resources. I suspect that we will continue to do this until Tuguldur is completed. We expect Tuguldur revenues to exceed the revenue of the rest of the company upon completion of the full project. Mariusz Skonieczny: Are there more properties to be sold in the next few months? Harris Kupperman: We have a few more that we are looking to sell. We've already sold most of the underperforming properties. We really don't have many left that we don't want—so it's really a question of prioritizing what we want to keep and what we should dispose of to re-invest in Tuguldur. Mariusz Skonieczny: What are the plans for the core real estate portfolio in terms of redevelopment? Harris Kupperman: We have a great pipeline of projects. The first priority is Tuguldur. Then we will move on with other projects. We have enough to keep us busy for quite some time. Mariusz Skonieczny: Now that you are the CEO again are you going to hold this position permanently or will you be looking for a new CEO? Harris Kupperman: I do not plan to hold this position permanently. But today our number one priority, and the reason I'm back in the CEO role, is to slash costs. CEO's are expensive and I'm willing to work for free, and know the business that I founded and grew as well as anyone. Once we are profitable and can focus on additional revenue generating opportunities, it will be more appropriate to bring in a real estate CEO who is more suited to run the company at that point in time. I think we will re-evaluate this as we see how things evolve at MGG. It was pretty obvious that I needed to step back in to dramatically cut costs and preserve the value of the company. Once the business stabilizes, I think we can once again go back to thinking about how to grow it. Mariusz Skonieczny: I am done with my questions. I would now like to ask you questions that were submitted to me by readers of my blog and newsletter. Anon: Does the termination of Paul Byrne mean that he is working independently rather than going to another firm full time? Harris Kupperman: I don't know of his current plans. AAGold: The basic investment thesis for MGG, and for that matter most emerging/frontier market stocks, is that very high GDP growth leads to earnings/cash flow growth which eventually leads to stock price / dividend growth. I've seen this basic premise disproved in some research studies, and in the specific case of MGG something seems very out of whack. If you consider the years 2012, 2013, and 2014, how much did Mongolia's nominal GDP grow in US-dollar terms (i.e., 2014 GDP / 2011 GDP)? I think the growth over those three years was probably quite substantial – maybe 30% measured in USD? But now let's take a look at MGG's same-store rental growth over that period, also measured in USD so it's an apples-to-apples comparison. I believe it's the case that, on a same-store basic measured in USD, MGG's rentals have actually *declined* over those 3 years. And if not an outright decline, MGG's rentals are at best approximately flat, and there's no way rentals in USD have grown anywhere near as much as Mongolia's GDP. So, it would appear that Mongolia's real estate businesses have gotten nowhere near their fair share of Mongolia's GDP growth over the past 3 years. So what's going on? Harris Kupperman: Our rents are a lagging figure as we are signing 1-5 year leases. Hence, growth in rental rates only shows up in our numbers AFTER we re-sign the leases upon expiry. In addition, a decline in the USD/MNT exchange rate of approximately 50% since we started the company has further hurt our ability to show these rental increases in our numbers. That said; in USD terms, rents on Peace Avenue have gone from the low teens per meter a month to the high twenties per meter per month since we started the company. They've effectively more than doubled in four years. If the currency will stabilize for a year or two, that growth will show up in our numbers and it definitely has shown up in the valuation of the property assets that we own. So we are getting some of the advantage of this increase. AAGold: Why has MGG's management stopped disclosing same-store rental information? For a while they were disclosing rental information each month in the letter to shareholders, where they would give year-over-year growth rates in local currency terms. I notice they started doing this once the rentals started growing nicely, and now they've suddenly stopped for the past few months. That makes me think the more recent numbers are poor and they don't want to talk about them anymore. Mariusz Skonieczny: Harris, thank you very much for this interview. I hope that your answers will help investors understand what is going on within MGG. Harris Kupperman: Mariusz, thanks for giving me a chance to further explain the changes that are happening at MGG. I think that these changes are both overdue and necessary. Now it is up to our management team to deliver on our cost cutting goals and put MGG into a stronger financial position to take advantage of the eventual rebound in the Mongolian economy. TORONTO, ON--(Marketwired - January 15, 2015) - Centerra Gold Inc. (TSX: CG) announced today that it met its 2014 annual production guidance and that consolidated gold production for 2014 totalled 620,821 ounces. This production total includes 567,693 ounces of gold from the Kumtor mine, located in the Kyrgyz Republic and 53,128 ounces of gold from the Boroo mine, located in Mongolia. During the fourth quarter of 2014, consolidated gold production was 301,236 ounces, including 291,635 ounces of gold produced by the Kumtor mine and 9,601 ounces of gold produced by the Boroo mine. Ian Atkinson, President and CEO of Centerra stated, "The Boroo operation continued to perform well in the fourth quarter, exceeding our revised production guidance for the year. At Kumtor, the operation met its annual production guidance and during the fourth quarter produced 291,635 ounces of gold as we accessed the high-grade SB Zone which we are continuing to mine in the first quarter of 2015." "For 2015 we are estimating consolidated gold production to be in the range of 480,000 to 535,000 ounces. No production from Gatsuurt has been included in our production guidance for 2015. At Kumtor this year, we are expecting relatively even quarterly production as compared to prior years when the majority of the ounces were produced in the fourth quarter. Centerra's projected consolidated all-in sustaining cost per ounce sold1 for 2015 is within a range of $898 to $1,003 and consolidated all-in cost per ounce sold1 (before taxes) is $1,003 to $1,121," he concluded. As previously disclosed, Centerra is continuing to study the impact on the Kumtor SB Zone of the buttress constructed early in 2014 in response to the increased movement of the Davidov Glacier, as well as the Kumtor block model, each of which may result in adjustments to Kumtor's reserve and resource estimates. Centerra is also evaluating the significance of lower than expected metallurgical recoveries experienced at Kumtor. Centerra expects to complete this work shortly and plans to release its reserve and resource update in early February. Kumtor's forecast 2015 production and unit costs are provided on a 100% basis and the forecast does not make any assumptions regarding possible changes in the structure and management of the Kumtor Project, including without limitation the level of ownership resulting from ongoing discussions with the Government of the Kyrgyz Republic and Kyrgyzaltyn JSC, Centerra's largest shareholder. See "Material Assumption and Risks" for other material assumptions or factors used to forecast production and costs for 2015. Centerra's 2015 consolidated gold production is expected to be 480,000 to 535,000 ounces. The Kumtor mine is expected to produce between 470,000 and 520,000 ounces in 2015. Kumtor's 2015 production guidance range is lower than that outlined in the life of mine plan set out in the Kumtor technical report filed on December 20, 2012 (the "2012 life of mine plan") primarily as a result of negative block model reconciliation, as previously disclosed, timing of ore release due to deferral of capital for mine haulage equipment and lower than expected metallurgical recovery. At the Boroo mine, gold production is forecast to be 10,000 to 15,000 ounces. The forecast annual production at Boroo represents ounces from the secondary leaching of the heap leach pad. The 2015 forecast assumes no mining activities at Boroo or Gatsuurt, and no gold production from Gatsuurt. January 15 -- Haranga Resources Limited (ASX:HAR, the 'Company') is pleased to announce the appointment of Mr. Lukman Wijaya (Stephen Lo) as a Non-Executive Director of the Company. Mr. Stephen Lo has been a Director of Lippo Group since January 2012 and has held Executive roles in Mining and Mine Product Processing Businesses. Mr. Lo graduated with a degree in Chemical Engineering from the National Taiwan University, Taiwan in 1989, and in 1993 took a Master program of Fertilizer Technology at National Chung-Hsing University, Taiwan. His work experience includes chemical industry projects, engineering, construction and management, having spent time in Middle East; North Africa; South and South East Asia; Mainland China and Korea. In total, Mr. Lo has ten years' experience in mining, management and technology, securing mining licenses, settling of government and social affairs; purchasing land; exploration; production; processing; logistics and export affairs. In addition to acting as Company Secretary since July 2014, Mr. Jack James has also been appointed as a Non-Executive Director of the Company. Additionally, Mr. Daniel Crennan has resigned as a Director of the Company effective immediately. The Board wishes to thank Mr. Crennan for his contribution to the Company and wishes him success in the future. As announced by the Company on 20 November 2014, the Company's shareholders approved, at a general meeting of the Company on that same day, a set of resolutions (the "November Resolutions") in relation to the Company's proposals to change Origo's investing policy, management structure and management incentive arrangements (the "Company's Proposals"). Details of the November Resolutions and of the Company's Proposals were provided in a circular posted to shareholders on 31 October 2014 (the "Circular"). The Company's Proposals included the transfer of the employees of the Group (the "Employees"), including Chris Rynning (Origo's Chief Executive) and Niklas Ponnert (Origo's Finance Director) but not including Wang Chao Yong (the Company's Chairman) (the "Employee Transfer"). This transfer was to be facilitated by each Employee agreeing to resign from the Group and enter into new employment contracts with a member of the Origo Advisors Limited group (the "OAL Group"). Following shareholders' approval of the November Resolutions, the Company and the OAL Group have been in the process of implementing the Company's Proposals - including the Employee Transfer. The Company today announces that the Employee Transfer has now been completed and that eleven Employees, including Chris Rynning and Niklas Ponnert, agreed to resign from the Group and are now employed by the OAL Group. Three Employees have not agreed to be reemployed by the OAL Group and their employment with the Group has been terminated (the "Terminations"). The Company's costs in connection with the Terminations are expected to be approximately US$21,000. With the Employee Transfer completed, the Asset Realisation Support Agreement with OAL and the Agreement Relating to Assets with OAL became effective on 13 January 2015 and as such, the Company is now externally managed by OAL on the terms described in the Circular. The Company's previous Investment Support Agreement dated 10 November 2009 between the Company and OAL has been terminated with simultaneous effect. Capitalised terms used in this announcement shall have the meanings given to them in the Circular. 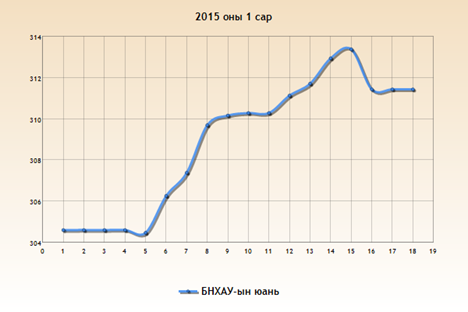 Ulaanbaatar, January 16 (MONTSAME) Five stock trades were held at Mongolia's Stock Exchange January 12-16 of 2015. In overall, 231 thousand and 258 shares were sold of 44 joint-stock companies totalling MNT 12 billion 654 million 532 thousand and 868.00. "Khokh gan" /25 thousand and 588 units/, "Remikon" /23 thousand and 532 units/, "Binse HK" /15 thousand and 600 units/, "Genco tour bureau" /8,319 units/ and "Moninjbar" /8,246 units/ were the most actively traded in terms of trading volume, in terms of trading value--"Binse HK" (MNT 12 million and 324 thousand, "APU" (MNT nine million 029 thousand and 520), "Tavantolgoi" /MNT seven million 510 thousand and 174/, "Darkhan khuns" /MNT four million and 850 thousand/ and "Mongol makh expo" (MNT four million 799 thousand and 600). As of 31 December 2014, total of 51.7 million shares of 139 Joint Stock Companies worth MNT24.2 billion, and 375.5 thousand Government retail bonds worth MNT36.1 billion traded through 255 and 9 trading sessions respectively with total transactions worth of MNT60.4 billion. In terms of trading value, value of share trading accounts 40.16% or MNT24.2 billion and value of government retail bonds accounts 59.48% or MNT36.1 billion respectively. Total trading value has decreased by MNT73.4 billion or 75.20% compared to the same period of last year. Amount of most actively traded 30 companies accounted 98.85% of total trading by volume and 94.39% of total trading by value respectively. During the reporting period, shares of 136 joint stock companies traded and 80 companies had share price increase, 40 companies had share price decrease and rest of 14 companies had unchanged share price compared to the same period of last year. During the reporting period, 9.6 million shares of "Merex" JSC worth MNT965.9 million and 520.7 thousand shares of "BDSec" JSC worth MNT1.1 billion traded on primary market at MSE respectively. Total of 10.2 million shares worth of MNT2.08 billion traded on primary market which accounted 8.59% of total trading. According to the resolution No. :389 of Financial Regulatory Commission dated on 21 October 2014, Mongolian stock exchange registered 1,000,000 Government Securities with face value of MNT100,000 worth MNT100.0 billion and started trading since 04 November 2014. During the reporting period, total of 9 government securities trading organized at MSE with 12 weeks, 28 weeks 52 weeks maturity period and total of 375.5 thousand government securities worth MNT36.1 billion traded. During the reporting period, total of 20.1 million shares worth MNT12.8 billion traded on block trading, which accounted 52.95% of total trading. End of the reporting period total 62 brokerage companies registered as member companies of MSE and 52 of them participated in trading. "BDSec"JSC, "TDB Capital"LLC, "TulgatChamdmaniBayan"LLC, "TengerCapital"LLC, "GolomtSecurities"LLC, "DelgerkhangaiSecurities"LLC, and "StandartInvestment"LLC were leading brokerage companies in terms of trading value. Total market capitalization of listed companies stood at 1 trillion 442.6 billion MNT indicating a decrease of 13.645% or MNT227.87 billion compared to the same period of previous year. During the reporting period, Top-20 Index's highest point reached 17160.49 units, lowest point was 14475.20 units and the average point was 15744.98 units. End of the reporting period, Top-20 index stood at 14854.24 units indicating a decrease of 8.88% or 1447.57 units compared to the same period of previous year. Share prices, included in the Top-20 index basket, Remicon/41.07%/, Mongol Shiltgeen/37.89%/, Baganuur/37.66%/, Mogoin Gol/37.30%/, Shivee Ovoo/35.06%/, Mongolia Development Resources/33.87%/, Tavan Tolgoi/27.40%/ and Khukh Gan/26.92%/ have increased compared to the closing price of same period of previous year. January 15 (Bloomberg) -- The Central Bank of Mongolia raised its policy rate 100 basis points to 13% from 12%, the bank says in statement on website, dated yesterday. January 18 (UB Post) The following is an interview with Governor of Mongolbank (Central Bank of Mongolia) N.Zoljargal, highlighting timely issues. If the debt ceiling isn't raised to 70 percent of GDP, how high will inflation rate go? Quite a ruckus was made regarding the debt ceiling at the parliamentary meeting. According to the law, the debt ceiling should be at 40 percent (of GDP) but now, it's at 53 percent. Last Friday, a proposal to raise it to 70 percent was submitted and was rejected. The specified percentage in the law has already been violated because the foreign exchange (FX) inflow has subsided, causing significant changes. Debt ceiling will directly be influenced if Mongolia's foreign exchange inflow improves. If it's really impossible to raise the debt ceiling, the guarantee of government loans, available for businesses, will equal to zero. FX inflow will have to become limited to some extent if the government can't provide currency support or guarantees to businesses, or get loans from foreign countries. The debt ceiling amount becomes an important factor for making decisions for Mongolbank. How will increasing the policy interest rate by one percent influence MNT against USD exchange rate? Since the new year, exchange rate has increased by two percent. This is very different from our expectation. High prices of parts and equipment of the mining sector shows that this sector will have positive improvements. FX inflow hasn't improved as much as we've anticipated. December brought good news to currency reserves. This provides opportunities to influence the currency policy. Mongolbank inflated the policy interest rate to 13 percent. How will the economy benefit from this? Macro calculations have been done in detail. According to the Currency Exchange Fund, the Mongolian economy is estimated to grow by five percent. For instance, we've accounted possible risks and opportunities if foreign direct investment jumps by a billion USD or by two billion USD. From practices in 2010, FX inflow exceeding expectation of a billion USD offset exchange rate by 100 MNT. It doesn't necessarily mean the economy will shrink. It can be said that the economy can recover its opportunities to expand from FX inflow as long as the macro balance is kept and the FX inflow is increasing. The government has been discussing the difficult economic conditions several times. The economic growth that reached 17 percent in 2011 slowed to 13 percent in 2014 and now, it has slumped to 5.4 percent. Economists believe that an economy suitable for real economic circumstances is being formed. Improved FX inflow will become the foundation to a long-term economic growth. Policy decisions were made based on actual situations. We're ready to modify our decisions if we see positive changes. If there isn't any FX inflow, how will Mongolbank preserve its currency reserve? 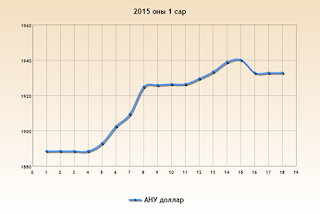 What's your prospect for the Mongolian economy by the end of 2015? This year, Mongolia will invest its foreign direct investment to Oyu Tolgoi and recreate the Mongolian economy of 2008. The economy in 2008 was three times smaller than its current size with only seven trillion MNT. Currently, Mongolia has an economy worth 21 trillion MNT. It's difficult to grow the current economy with its current FX inflow. Foreign direct investment is at the top of our "to do" list. Last year, Mongolian exportation amount increased. Crude oil, gold, and copper exports have increased while iron ore and coal exports are still lagging. This indicates that Mongolia has potential reserves and resources. Foreign direct investment doesn't recover easily. There are tons of works and projects that need to be done. The government has to pay attention to these projects urgently. Parliament is planning to cut over 900 billion MNT from state revenue and expenditure. How consistent will this be to the budget and monetary policies? Mongolbank is also making changes in the policy interest rate, right? Superficial understanding is spreading around, such as the monetary policy can be weak since the budget is being cut. The factor that actually influences the monetary policy is the budget deficit, not the total budget amount. Compared to 2014, the planning for budget revenue and expenditure is expected to increase by 18 percent in 2015. Everyone knows that this doesn't happen in reality. In the past two years, budget was cut by a trillion MNT – deficit from overdue loans of banks and construction companies. It's good that money that will not return anyway is accounted as "gone money". The revenue and expenditure gap, or deficit, is still very big. This means that the gap will be fixed from domestic financial markets, which will result in drawbacks on the domestic financial sector and the development of the banking sector. Budget deficit has to be calculated in policy measures. Cutting 900 billion MNT from both the budget revenue and expenditure is a healthy remedy. Still, the budget deficit is the vital part of policy decisions. The year-end equilibrated budget deficit became 3.7 percent (of GDP). This figure will become nearly seven percent in the coming year when the Development Bank is included. Mongolia has accumulated many unfinished buildings over the years by estimating over exaggerated revenue and ordering many building for construction which are later financed with bank loans. At the end of the year, the buildings don't receive money from the government and is never completed. Budget revenue never reaches the estimated balance and expenses become unable to cover. Banks are pointing out that overdue loans are increasing risks because this ineffective practice has continued for several years, increasing deficit to a trillion MNT. The fact that Parliament is bringing investment budget to a realistic level is making it easier to reduce loans of potential risks. Didn't cutting the budget revenue and expenditure by nearly a trillion MNT double the deficit, making it four percent of GDP? High budget deficit is bad for macro economy. The deficit has become one of the reasons to increase the policy interest rate. Low budget deficit increases spaces in the economy for private sectors to operate. Will commercial banks pursue policies to tighten its loans and increase the interest rate? Policy interest rate plays a key role in estimating loan interest rates. When the policy interest rate was 13.25 percent in 2012, inflation was at 14 percent and loan interest rate at 18 percent. Increasing policy interest rate effects loan risks rather than directly influencing loan interest rates. If you see it from this perspective, loan interest rates don't necessarily have to increase if FX inflow, risks forming in the economy, increases. Events in the first half of the year have the most influence. Exactly how much currency reserve does Mongolbank have? At the end of 2014, the currency reserve of Mongolia was 1.6 billionUSD, which is equivalent to 4.9 months of Mongolia's import needs. According to the Currency Exchange Fund standards, the economy will not face potential risks as long as it has sufficient currency reserves for 2.8 months, approximately 12 weeks. We believe that the macro economy of Mongolia will not face any risks in the near future. If FX inflow continues to increase, it will contribute considerably to the economic growth of Mongolia. Will the price stabilization program and housing loans with eight percent interest rate continue? Parliament has directed specific guidelines to gradually reduce price stabilization programs, issued mortgage loans with eight percent interest rate in the economy, and loans supporting the construction sector. The program was initially specified to be active for three years and it's being executed accordingly. The main difficulty is linked it to the fact that nine out of 10 USD coming into Mongolia is being spent on mining. Four out of these nine USD have disappeared. If we don't change our structure that is dependent on one sector, the cycle will repeat. Even if we overcome this period, everything will repeat four to five years later. What we need to do is to make internal structural reforms. The government and Mongolbank have concluded that it's better to focus on loans aimed at savings, and plan the state budgets properly without a high deficit. Will the interest rate of mortgage loans change? Currently, 1.1 trillion MNT was issued for eight percent interest loans. Before the New Year, demand for the eight percent interest loan decreased by three folds. Since the demand has declined, capital sources aren't being repaid and instead, given to banks. Mongolbank discussed the issue to reduce interest rates to seven or nine at the previous monetary policy committee meeting. We concluded that the interest rate doesn't need to be changed as the eight percent loan was the most suitable action to boost savings. Increasing it to nine or 8.5 percent interest will overpressure the people by 20 to 30 billion MNT. Mongolbank will continue issuing eight percent interest loans. Ulaanbaatar, January 15 (MONTSAME) At its irregular meeting on Thursday decided to withdraw a draft amendment to the law on budget stability which submitted to parliament on Monday, and reflect a clause in it about minimizing the total amount of debt in the GDP in several phases. The amount of both domestic and foreign debt expressed a current value will not exceed 60% of the GDP in the budgetary year of 2015, 55%--in 2016, 50%--in 2017, and 40%--in 2018, in accordance with the amendment to the law. Ulaanbaatar, January 15 (MONTSAME) The national consumer price index increased by 0.8 per cent in December 2014 from the previous month, by 11.0 per cent against beginning of the year. An increase of 0.8 percent was mainly due to increases of 1.1 percent in food and non-alcoholic beverages, and 1.5 percent in clothing, footwear and cloth. Ulaanbaatar, January 15 (MONTSAME) As of the end of 2014, 52.0 million livestock were counted at the national level, of which three million horses, 3.4 million cattle, 349.3 thousand camels, 23.2 million sheep and 22 million goats. The total number of livestock increased by 6.8 million heads or 15.1 percent compared to the previous year, in specific, the number of horses -- by 376.4 thousand or 14.4percent, of cattle – by 504.4 thousand or 17.3 percent, of camel -- by 27.8 thousand or 8.6 percent, of sheep -- by 3.1 million or 15.7 percent, and of goat by 2.8 million or 14.5 percent. In 2014, 401.4 thousand heads of full-grown livestock had been lost, which amount equals to 0.9 percent of total livestock as counted at the beginning of the year. Ulaanbaatar, January 16 (MONTSAME) According to the report of the Bank of Mongolia (BoM), money supply (broad money or M2) reached MNT 10.6 trillion at the end of December 2014, going up by MNT 715.3 billion or 7.2 percent from the previous month. It also shows an increase by MNT 1.2 trillion or 12.6 percent against the previous year. As of the end of reporting period, currency issued in circulation reached MNT 809.7 billion, increasing by MNT 40.7 billion or 5.3 percent from the previous month, while going down by MNT 31.5 billion or 3.7 percent from 2013. Ulaanbaatar, January 16 (MONTSAME) As of the preliminary result of 2014, total equillibrated revenue and grants of the General Government Budget amounted to MNT 6223.4 billion, and total expenditure and net lending of the budget reached MNT 7031.4 billion, representing a deficit of MNT 808.0 billion in the equilibrated balance of the General Government Budget. Compared to the previous year, tax revenue has increased by MNT 135.1 billion or 2.7percent. This increase mainly reflected increases of MNT 125.6 billion or 16.9 percent in other tax revenue, and of MNT 97.2 billion or 11.1 percent in social security contributions. However, income taxes decreased by MNT 56.8 billion or 3.0 percent in taxes on goods and services, MNT 26.1 billion or 6.8 percent in taxes on foreign trade, MNT 10.9 billion or 1.0 percent in income tax revenue, of which MNT 38.9 billion or 5.9 percent was in corporate income tax. In 2014, total expenditure and net lending of the General Government Budget reached MNT 7031.4 billion and increased MNT 866.7 billion or 14.1 percent compared to the previous year. This increase was mainly due to increases of MNT 249.2 billion or 16.7 percent in capital expenditure, MNT 237.6 billion or 12.6 percent in subsidies and transfers expenditure, MNT 229.9 billion or 85.0 percent in interest payments expenditure, MNT 206.4 billion or 8.6percent in expenditure on goods and services, although there were decreases of MNT 56.5 billion or 46.5 percent in net lending. Ulaanbaatar, January 16 (MONTSAME) According to the report by the National Statistics Office, a total of 58.6 million tons of freight and 346.0 million passengers (double counted) were carried by all types of transport in 2014. Carried freight increased by 8.9 million tons or 17.8 percent and carried passengers -- by 37.3 million people or 12.1 percent, compared to the previous year. Railway carried 21.0 million tons of freight and 3.3 million passengers (double counted). Compared to 2013, the amount of carried freight decreased by 39.4 thousand tons or 0.2 percent and number of carried passengers -- by 453.4 thousand or 12.1 percent. The revenue from railway transport in 2014 reached MNT 427.2 billion reflecting increase of MNT 5.8 billion or 1.4 percent compared to the previous year. In 2014, 3.3 thousand tons of freight and 672.7 thousand passengers (double counted) were carried by air transport. Compared to the previous year, the amount of carried freight decreased by 641.6 tons or 15.7 percent and of carried passengers, by 105.8 thous.persons or 13.6 percent. The air transport revenue of 2014 totaled to MNT 239.0 billion, showing decrease of MNT 8.3 billion or 3.4 percent, against the previous year. Roads carried 37.6 million tons of freight and 342 million passengers (double counted), indicating an increase of 8.9 million tons or 30.9 percent in carried freight and of 37.8 million people or 12.4percent in carried passengers' number, compared to the previous year. Ulaanbaatar, January 15 (MONTSAME) In 2014, the population of Mongolia reached 2995949, which indicates an increase by 65672 people or 2.2 percent compared to the previous year, reports the National Statistics Office. Out of 82839 children born in 2014 at the national level, 1124 or 14 percent were born overseas. A total of 81228 mothers delivered children and the number of live births amounted to 81715, in 2014. The number of the mothers increased by 1857 or 2.3 percent and that of the children showed increase of 1935 or 2.4 percent, compared to the previous year. Infant mortality rate reached 1251 deaths, increasing by 85 children or 7.3 percent, and mortality rate for children under the age of five reached 1505, increasing by 67 or 4.7 percent, compared to 2013. Mongolia received its two-millionth citizen on July 11 of 1988, and expects the three-millionth citizen in 2015. Mogi: let's see if the new policy rate can attract bank, first issuance doesn't look promising. 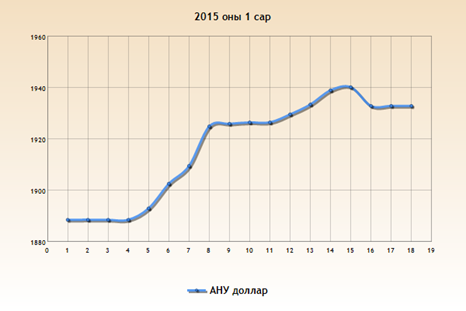 January 14 (Bank of Mongolia) Auction for 3 years maturity Government Bond was announced at face value of 10 billion MNT and each unit was worth 1 million MNT. Government Bond was not sold due to absence of both competitive and non-competitive bids. January 14 (Bank of Mongolia) Auction for 28 weeks maturity Government Treasury bill was announced at face value of 30.0 billion MNT. Face value of 13.0 billion MNT /out of 28.0 billion MNT bid/ Government Treasury bill was sold at discounted price and with weighted average yield of 15.292%. Please find expanded information from Table. January 15 (Bank of Mongolia) On the Foreign Exchange Auction held on January 15th, 2015 the BOM has received bid offer of 43.65 million USD as closing rate of MNT 1939.00-1944.00 and 142.5 million CNY as closing rate of MNT 312.98-314.00 from local commercial banks. The BOM has sold 8.0 million USD as closing rate of MNT 1943.72 and 98.5 million CNY as closing rate of MNT 313.36. On January 15th, 2015, The BOM has received USD Swap agreement ask offer of 30.0 million USD and MNT Swap agreement bid offer in equivalent to 42.0 million USD from local commercial banks and accepted the offer. January 15 (Bloomberg) -- Mongolia exports of copper concentrate rose 112% in 2014 to 1.4m tons from 649,800t yr earlier, National Statistical Office says in website statement. * Mineral products accounted for $4.8b of the exported goods in 2014 compared to $3.5b in the same period yr ago. * Mongolia exported $5.8b worth of goods in 2014 including $5.1b worth of goods to China. Most analysts agree that rising supply and sluggish demand by China will keep pushing copper price downward. Price Waterhouse and Coopers (PwC) stated in its annual copper survey of 2014 that copper's current level is the result of a supply-demand imbalance, which some predict will worsen in the months ahead. ULAN BATOR, Jan 16 (Reuters) - Struggling Mongolia is hoping to drum up more foreign investor interest in its flagging mining industry after opening up an additional 10.1 million hectares (39,000 square miles) of territory for mining exploration. The country, estimated to possess $1.5 trillion worth of mineral resources like gold, copper and iron ore, will start the application process for exploration licenses on Jan. 26, the Ministry of Mining told Reuters on Friday. Mongolia is trying to entice foreign investors back to the country, with many deserting after a series of controversial disputes and a perceived shift towards "resource nationalism" among legislators. The additional space means that nearly a fifth of the country's territory is now available for mining, amounting to 116,000 square miles. "The groundwork has been laid to issue exploration special licenses in an orderly and planned form, taking the infrastructure, green development, and investment equality into consideration," said ministry spokesman Galsan Bodibilguun. Licenses may be granted to investors via application as well as open-tender bidding, he said. Mining is central to Mongolia's economic ambitions. Copper from the giant Oyu Tolgoi mine run by Rio Tinto makes up 44 percent of the country's exports. Coal is a distant second with 15 percent, followed by iron ore with 8 percent. However, the industry also been hurt by falling commodity prices and a weakened global economy, with foreign investment from January to November last year falling 71 percent on the same period a year earlier. A Mongolian judge cancelled 106 licenses in 2013 during an investigation into corruption. The Toronto-listed Kincora Copper wrote off C$7 million in 2013 for the loss of licenses held by its subsidiary Golden Grouse, but it may see two of them restored or be compensated next month, the company's chief executive Sam Spring said this week. Mongolia has also enlisted the help of foreign miners to take over the management of Erdenes Tavan Tolgoi, the state-owned mining unit seeking to develop the country's largest coal deposit in the south Gobi region. The ministry said it plans to wrap up negotiations for $4 billion of investment with China Shenhua Energy, Japan's Sumitomo and Energy Resources LLC, a wholly owned unit of the Mongolian Mining Corp, before the start of Mongolian lunar new year on Feb. 18. January 15 (infomongolia.com) The Authority of Mineral Resources announces to accept paper-requests for exploration licenses starting from January 26, 2015. According to statement, exploration licenses will be allocated to 19.9% of total territory of Mongolia or 31 million ha, of which 13.4% or 20.9 million ha will be issued by accepting applications and the rest of 6.5% or 10.1 million ha will be issued under selection. Applications for licenses will be received and dealt with "One Window" service and order numbers will be given on-line. The second option of selecting applicants will be conducted under competitive procedure, which is common in international practices. In other words, bidders will be selected under 100-point criteria, where the highest bidder will be given up to 50 points and remaining 50 points will be considered the developed project to execute on the land as well as staff skill and experience and how well equipped with techniques and equipment, etc. January 16 (news.mn) Minister of Mongolia M.Enkhsaikhan met with Ambassador Extraordinary and Plenipotentiary of Japan to Mongolia Takenori Shimizu at the Government House on Thursday. Minister of Mongolia M.Enkhsaikhan, who is in charge of dealing with investors for the development of Tavan Tolgoi, reported on the negotiation process for the Tavan Tolgoi investment agreement and exchanged views with the ambassador. At the meeting, Ambassador Shimizu said, "Japan is interested in importing minerals from more and more countries. Thus, we want this project to achieve success. Foreign direct investment is crucial for Mongolia`s development. There is a need to improve the investment environment in Mongolia. The massive Oyu Tolgoi project is being watched by Japanese investors. Oyu Tolgoi is a symbol of a mega project investment. Minister of Mongolia M.Enkhsaikhan said, "You are someone who has good awareness of Mongolia. I highly respect your efforts and support that have brought about good bilateral relations between Mongolia and Japan." January 15 (news.mn) The DP caucus held a special meeting on Wednesday to review the issue of removing monthly allowances for children, mothers, and recipients of the Mongolian Mother's Glory Order 1st and 2nd class in the scope of cuts to the government budget. At the meeting, MPs agreed to continue granting allowances for children and the Mongolian Mother's Glory Order 1st and 2nd class at least. MPs also agreed to find resources for increasing public employees' salaries and pensions. The government decided to grant the allowances for children only to targeted groups and to cut allowances for mothers with the Mongolian Mother's Glory Order whose children have reached 18 years of age, and not to increase pay and pensions in the government budget revision bill for 2015. However, parliament has decided to continue some of the social welfare programs that were considered for cuts. Ulaanbaatar, January 15 (MONTSAME) A member of Parliament J.Batzandan received Thursday the resident representative of the International Financial Corporation (IFC) to Mongolia Mr Tuyen Nguyen, at the latter's request. Mr Nguyen informed that the IFC and the Ministry of Justice of Mongolia has signed a Memorandum of Understanding on Technical Assistance for creating the virtual environment for legal enforcement in case of the adoption of the draft law on Immovable property and Intangible asset mortgages. He also noted that over 30 countries adopted such laws and the results are satisfactory. Mr Batzandan MP said he is putting his efforts on the development of the draft law on Immovable property and Intangible asset mortgages and shared his opinion on the cooperation with the IFC on the enforcement of law, if adopted. The draft law was submitted to the Parliament in June, last year, on the motives that Mongolia faces an urgent need to promote through mortgage loans the economic circulation of immovable and transferable intangible assets such as stocks, treasury bills, receivables, intellectual properties, and to facilitate such relations with an adequate legal environment in Mongolia. January 16 (news.mn) Previously, in order to get Mongolian passports for foreign travel, applicants faced several stages and long procedures for filing applications, paying fees, invalidating previous passports, and more. Now the process is being changed and Mongolian citizens are able to receive foreign passports without any long procedures and in a very easy way. Applicants can now pay fees for foreign passports at any commercial bank in Mongolia, and at the Registration Office, only a fingerprint is required to receive a foreign passport. Applicants can also use the postal service to have passports delivered to their offices or homes. Delivery of a foreign passport to any destination in UB will cost 3,500 MNT. Last year, more than 3,000 citizens used this service. January 18 (UB Post) In 2014, the government dedicated 250 billion MNT for pension and salary increases for state employees. The decision was officially made on January 15 to increase salary and pensions by 10 percent, following the results of a three-party municipal labor concession agreement, the Agreement of Labor and Society, made between the Labor Ministry, Mongolian Trade Union, and Joint Union of Employers. Accordingly, a total of 103 billion MNT will be additionally allotted for the increase in the 2015-2016 state budget. Ninety billion MNT will be spent on salary increases for civil servants and 13 billion MNT will be devoted to pension and allowance increases. A discussion regarding when to increase the salaries and pensions, as well as which departments will first see the increases, will be held after the approval of 2015 budget amendments. The agreement also includes the decision to exempt the payment of personal income tax for those earning minimum wage to increase the real income of taxpayers. The minimum monthly wage in Mongolia is 192,500 MNT, which means that approximately 12,000 MNT will not be withdrawn from minimum wage salaries each month. The three-party labor talks also resulted in the agreement that when private sector businesses are about to make a decision to liquidate, file for bankruptcy, or carry out job cuts, an employer should discuss the decision in advance with employee protection agencies and take measures to save jobs. Critics question how the salary and pension increases will be funded when the state budget is in crisis. According to MP Ch.Khurelbaatar, the government estimates it will be able to finance the expenses by imposing a tax on imported oil products and increasing the excise tax amount. However, a decision on these tax changes has not been finalized yet. Labor representatives say there is an urgent need to increase salaries and pensions, as salary increases are not catching up with inflation rate increases. According to a survey by Mongol Bank, 1.2 million people are working in the industrial sector and 35 percent of them took out salary loans of 1.2 trillion MNT. Some sixty-five percent of pensioners have taken out pension loans. January 15 (news.mn) In Wednesday's meeting of the Standing Committee on Security and Foreign Policy MP G.Batkhuu was re-elected as head of the sub-committee of the Standing Committee. At the meeting, MP S.Oyun asked G.Batkhuu to pay attention to the still unsolved assassination of Mongolian Member of Parliament Sanjaasuren Zorig, which occurred under circumstances that strongly suggested a political or financial motive. Sister of Sanjaasuren Zorig, MP S.Oyun said that there had been a working group to focus on the case organized by the sub-committee under the previous parliament. January 18 (UB Post) Female Members of Parliament L.Erdenechimeg, Z.Bayanselenge, and D.Sarangerel visited Maternity Hospitals No. 2 and No.3 last Friday, in regards to receiving the three millionth citizen of Mongolia. Maternity Hospital No.3, located in Bayanzurkh District (with 300,000 residents), has 45 beds and employs 32 doctors and 118 staff. The hospital is operating over capacity, therefore, numerous risky conditions have been created, said the hospital's director during the female parliamentarian's visit. He added that in 2015, the budget for drugs and medical supplies and equipment was cut, which has caused problems. Mongolia is expected to receive its three millionth citizen in ten days. The government has issued resolutions and decrees to celebrate that day. "Keeping up sufficient operations of the maternity hospital in such understaffed and unpleasant conditions is the great work of you, obstetricians, nurses, and other staff of the hospital. We will work on increasing the budget for medical supplies and equipment expenses," pointed out MP L.Erdenechimeg. Female MPs also stated that even though the government is implementing policies to increase the population and support the birth of the three millionth citizen, it is not making any investments in the maternity hospitals which will receive the newborns, therefore they will keep working on drawing the government's attention to the issue. Afterwards, female MPs were introduced to the operations of the Second Maternity Hospital. The hospital has a standard of one doctor serving 100 patients a year, however, as of 2014, one doctor served 627 patients, stressed hospital Director B.Oyunkhand. Professional organizations have issued several warnings about the building's longevity having expired and it being unequipped to meet current demands, said B.Oyunkhand, and asked the female parliamentarians to pay attention to this issue and find solutions as soon as possible. January 15 (Mongolian Economy) The majority of Mongolian mines are located in the Gobi region. To operate, the mines use non-renewable groundwater. Tuesday the World Bank held a conference on mining support infrastructure for the region in Ulaanbaatar. During the conference, project coordinator B.Enkhbaatar emphasized the water supply issue in Mongolia's mining sector development, describing the importance of creating a water circuit basin in order to reuse the used water. A World Bank senior social development specialist in charge of the urban, rural and social development, Dr Warren Paul Mayes Evans said: "In the world, the mining sector receives many complaints related to earth and water. That's why raising matter should be cleared by related regulation and information should be widely given"
The conference stressed the need for the government, private enterprise and citizens to actively participate in mining infrastructure development. Companies and organisations presently leading extraction are to provide genuine information to citizens. S.Bayantsetseg, a specialist at the department of environmental evaluation and auditing at the Ministry of Environment, explained that the evolution of environmental evaluation should be reported as well. Any lack of participation among mining sectors actors, results in issues like misinformation and inefficiency. The World Bank granted Mongolia a USD 25 million development loan for mining infrastructure in 2011. The majority of the loan goes toward mining infrastructure preparation work: design, feasibility and environmental studies. In addition, Baganuur coal mine, the main energy supplier for the mining sector, is to increase its coal reserve to 6 million tonnes. A research study financed by the World Bank loan concluded the former mine reserve of about 3 million tonnes to be out of date, as the last evaluation occurred in 1978. Shuren Water Power Plant, which will use the Selenge River to run, and the Orkhon River project are now in preparation process. January 18 (UB Post) On Friday, members of the Mongolian Association of Flour Producers made a statement to the press, announcing the necessity for wheat import from Russia, as domestically harvested wheat doesn't meet flour standards. Chairman of the Mongolian Association of Flour Producers Ch.Enkhbayar said that the harvest was sufficient this year, but the quality was poor. He said, "There are various types of flour, like white, brown, grained, or fine. If we mix other Russian-grade wheat with domestic wheat, we will be able to produce high-quality gluten flour. There is demand for flour with high gluten content, so we need to import 20,000 tons of wheat in the near future." Ch.Enkhbayar added that by importing wheat from Russia, the quality of flour will be advanced, meeting consumer demands. The capacity of flour producers is three times greater than the demand, and the head of the association said that the export quota of flour and by-products should be open. Enkhbayar said, "Domestic and foreign needs should be correctly determined and supported through policy to keep the balance." Association member Z.Khurelbaatar said that flour producers have been fulfilling their duties according to the agreements of the price stabilization program. He said, "We don't purchase wheat with cash, we use our collateral and take loans. This year, Mongol Bank and the Ministry of Agriculture implemented a new system with voucher loans, and the wheat became a loan itself, so farmers are receiving their pay immediately." Z.Khurelbaatar highlighted that flour producers are not using those monies, reducing foreign currency flow. Association member Ts.Otgonbaatar said that domestic flour's appearance has improved when compared to Russian flour, and that the technology of flour production in Mongolia meets global standards. Otgonbaatar added that the factories have the capacity to produce 2,000 tons of flour daily, but only 1,000 tons is being used domestically. "We could import wheat from Russian and produce flour, and produce animal feed with the remaining material for export to China," said Ts.Otgonbaatar. Association member J.Chinzorig said that if the taxes will be increased, then the price of flour will increase as well. Currently, the price of wheat exported by Russia is 200 USD per ton of flour, and the price will reach 256 USD per ton by February 1. Chinzorig said, "We will have a shortage of wheat this year. We need to import wheat from Russia, as it is now cheaper." January 14 (EBRD) The European Bank for Reconstruction and Development (EBRD) increased its investments in 2014, meeting rising demand from emerging economies grappling with protracted weakness and the impact of geopolitical tensions. The rise in EBRD financing to €8.9 billion from €8.5 billion in 2013 came despite a sharp fall in its investments in Russia following guidance from shareholders in July that they would, for the time being, consider no new projects in the country. As a result the Bank was able to invest more strongly in other countries that it serves. Demand is expected to remain high in 2015 with investments roughly in line with 2014 levels. Ulaanbaatar, January 16 (MONTSAME) In 2015, works will be performed in the capital city with money of totaling MNT 219 billion and 50.4 million in frames of the 2013-2016 action plan of the UB Mayor and the 2015 socio-economic goals. The money of MNT 149 billion and 501.7 million is allotted from the city's budget, MNT 30 billion and 944.2 million--from the city's road fund, and MNT 38 billion and 604.5 million--from the fund for local development. In addition, money of MNT 164 billion will be given from the state budget for the works to be done in Ulaanbaatar. The investment from the various resources will be spent for many works such as drawing up designs of new buildings, auto-roads, engineering pipelines, freeing lands, working out a master plan, constructing new apartments and renovating pipelines. Moreover, the money will finance those projects that have not been finished yet and the repayment of some projects and measures being implemented with local concession. January 15 (news.mn) The Mongolian Transport, Communications and Petroleum Workers Union will hold a press conference today to announce that the Ulaanbaatar Public Transport Service is calling for a demonstration in order to have their salary and social welfare issues resolved. The removal of allowances granted to Public Transport Service employees from the Ulaanbaatar City Budget motivated Ulaanbaatar Public Transport Service employees to demonstrate. Bus drivers and conductors of Public Transport Service will report about the decision against pay increases for employees. The press conference is being held at the Confederation of Mongolian Trade Unions today. January 16 (news.mn) In order to reduce traffic congestion in UB, it has been decided to resettle open-air markets operating in the capital. Auto markets are now being relocated and a project to build an auto trade complex started in March last year. The first stage of the complex was supposed to be launched in October 2014 but work on the complex was postponed. The first stage of the project is almost 80 percent complete, and the Administration Office of Ulaanbaatar is planning to launch business at the auto trade complex starting in March this year. The construction of the complex will be ready for 100 percent utilization in June 2015. January 18 (UB Post) Since January 1, 2015, six people have died and 155 more were injured in traffic accidents. Four of the fatalities were adults and two were young children. A collision over the weekend resulted in two deaths and many more injured. Drivers and transportation companies are being held accountable and warned of the risk of unsafe driving. A vehicle collision was reported early on Saturday near Uliastai, where two people were killed and about ten more were injured. The victims of the accident are currently hospitalized at the National Trauma and Orthopedic Research Center. A microbus filled with passengers and a ZIL-130 truck reportedly collided while one vehicle was trying to overtake the other at an excessive speed at around 9:00 a.m., although final results of the Traffic Police investigation are not complete. The road was temporarily closed for investigation following the incident and reopened a few hours later at 2:00 p.m.
Officials of the Traffic Police Department, National Institute of Forensic Science, and Ulaanbaatar Emergency Management Agency worked at the scene to determine the exact cause of the collision. A bus driver who was responsible for a crash resulting in the deaths of six passengers last summer was sentenced to nine years in a maximum security prison last week. District Primary Criminal Court No.2 issued the sentence based on Mongolian Criminal Code's Clause No.215, which states that citizens who cause the deaths of two or more people due to violations of traffic regulations shall be sentenced to five to ten years in prison and a five-year ban from driving. The long-distance bus the driver was driving from Baruun-Urt to Ulaanbaatar skidded off the road and flipped over four to five times, leaving six people dead and 43 injured on June 22. The crash occurred three kilometers from Tsonjin Boldog in Erdene soum of Tuv Province. The bus belonged to Daichin Sukh LLC and the crash caused 36.4 million MNT in damages to the company. The Traffic Police Department (TPD) has received a total of 3,155 traffic accident reports so far this year. Before the Nalaikh accident, one pedestrian was hit by a car while jaywalking in Yarmag. The victim died on impact. In 2014, 20 people died while crossing roads in Yarmag and Nisekh, where more traffic accidents are reported compared to other areas of the city. The roads in these areas are rarely congested, so it is common for drivers to exceed speed limits and run red lights, which results in many accidents, reported TPD Major L.Amarjargal. "Pedestrians get involved in traffic accidents and injure themselves by running across roads while cars are approaching, or just simply jaywalk very often. We advise all residents taking part in road traffic to follow traffic regulations and respect each other to stay out of accidents," added L.Amarjargal. January 15 (infomongolia.com) The City Department of Education in collaboration with the Union of Mongolian Secondary Schools' Students have decided to issue a smart ID card, relied on latest technology and complies international standards, to 138 thousand pupils of the capital city schools. According to officials, a Pupil's Card of the City will cost 1,400 MNT (Tugrug), which is effective three years from the date of allocation and will be given to pupils from January 27, 2015. The Pupil's Card will not only include a complete information, but also can be used as an ID to enroll any training centers or public events at discounted prices or free as well as present in public transportations for free ride being implemented under "Smart School" Program. Moreover, City Department of Education and Union of Mongolian Secondary Schools' Students have been partnering with Urgoo Cinema that allows pupils with new ID card to have 20-50% discounts on each movie. Besides, "Khaan" and "Monre" insurance companies pledged to install for free the Pupil's Card reader machines at all schools designated and "Kewiko" company, a wireless internet service provider, provides with a free access to any on-line trainings and at discounted prices to other internet services. Prague, Jan 14 (CTK) - President of Mongolia Tsakhia Elbegdorj will arrive in Prague from Berlin by train on Sunday and he will meet supreme officials, including his Czech counterpart Milos Zeman, during a three-day visit, according to CTK information. Since Elbegdorj will unusually take a train to Prague, the welcome ceremony will be held at the main station, Zeman's spokesman Jiri Ovcacek said. A red carpet, both countries' flags and the Prague Castle honorary unit will be prepared for the ceremony. The official part of the visit starts on Monday. Elbegdorj will be welcomed at the first courtyard of Prague Castle, the presidential seat, with military honours before his private meeting with Zeman. A press conference will follow. On Monday afternoon, Elbegdorj is to meet the chairmen of the lower and upper houses of parliament, Jan Hamacek and Milan Stech (both Social Democrats, CSSD), respectively, their assistants told CTK. "Possible topics of the talks might be the Czech firms' participation in state contracts in Mongolia and cooperation in the use of drinking water sources," said Eva Davidova, from the Senate's press section. Prime Minister Bohuslav Sobotka (CSSD) is also to talk to Elbegdorj, but their meeting has not been officially confirmed yet. Elbegdorj will stay in the Czech Republic until Tuesday when he is to visit Charles University (UK) in Prague. Petr Podzimek, from the UK press section, said Elbegdorj would meet UK rector Tomas Zima. "They will primarily talk about bilateral cooperation between UK and Mongolian educational institutions as well as the development of the Mongolian studies at UK," Podzimek told CTK. UK spokesman Vaclav Hajek said an informal meeting with some 30 students of Mongolian studies was also planned. Mongolian studies in the Czech Republic have a good reputation abroad and even Croats, Poles and Slovaks study this programme at UK, its representatives say. "Our renowned Mongolian studies scholars have succeeded in creating a study centre on a high professional level in 20 years thanks to international cooperation. Textbooks of the standard and colloquial language as well as of the classical script are being used by students all over the world because of their high quality," the university says. January 16 (infomongolia.com) On January 15, 2015, Foreign Minister L.Purevsuren received in his office the General Secretaries of Mongolian National Olympic Committee as well as Federations and Associations of Judo, Freestyle Wrestling, Boxing, Football and Shooting, where the Olympic Champion N.Tuvshinbayar was also present. During the meeting, parties exchanged views on how to expanding campaign in abroad as well as making a Mongolian brand when to organize international competitions home, and talked about the possibilities of obtaining the right of hosting the 2017 Judo World Championship in Mongolia. Moreover, the notable reason to meet the sports envoys was an initiation by the Foreign Minister to host the "North Korea - South Korea - Mongolia Judo for Peace 2015" competition in Ulaanbaatar. The sports representatives expressed their gratitude for reception and warmly accepted the initiations proposed by the Minister and pledged to support and closely cooperate to undertake the discussed issues. Ulaanbaatar, January 15 (MONTSAME) Vice Chairman of the Grand National Assembly (parliament) of the Republic of Turkey Mr Sadik Yakut Wednesday legged the Embassy of Mongolia in Turkey. The Ambassador Extraordinary and Plenipotentiary of Mongolia to Turkey Mr B.Batkhishig briefed about a policy of the newly formed cabinet of Mongolia and goals of the Mongolia-Turkey relations for this year, and then asked the Vice Speaker to augment investments to be made to Mongolia and to tackle an issue of a soft-loan. Mr Sadik Yakut expressed his satisfaction with a sustainable development of the inter-parliamentary ties, and said he will convey requests of the Mongolia to his country's parliament and to seek an opportunity to realize them. Visited Mongolia several times, Mr Sadik Yakut is one of the Turkish influential politicians to focus big attention to the Mongolia-Turkey ties and cooperation and increasing loans and assistance for Mongolia. January 14 (Sydney Morning Herald) A former police commando at the centre of a sensational murder case in Malaysia who has been sentenced to hang in Kuala Lumpur is believed to be living in Australia. Malaysian police say they will ask Australian authorities to arrest and extradite Sirul Azhar Umar, one of two policemen convicted over the murder of glamorous Mongolian socialite Altantuya Shaaribuu amid allegations of high-level bribery and political intrigue in Kuala Lumpur. The presence of Sirul, a former bodyguard of Malaysia's Prime Minister Najib Razak, in Australia would create a dilemma for the Abbott government, which opposes the death penalty. Australia signed an extradition treaty with Malaysia in 2006. Prime Minister Tony Abbott said last week Australia will make the "strongest possible representations" on behalf of Myuran Sukumaran, the Bali Nine drug mule on death row whose bid for clemency has been rejected by Indonesian President Joko Widodo. "Australia opposes the death penalty. We oppose the death penalty for Australians at home and abroad," he said. "We obviously respect the legal systems of other countries but where there is an attempt to impose the death penalty on an Australian, we make the strongest possible diplomatic representations." Sydney grandmother Maria Elvira Pinto Exposto, 51, faces a mandatory death sentence if found guilty in Kuala Lumpur of drugs charges. Kuala Lumpur police chief Mohmad Salleh told journalists Malaysia will seek the co-operation of international police to arrest Sirul, a father of two. "To date, the Malaysian Immigration Department has confirmed that he went abroad, namely Australia. He went in October last year," he said. "We will liaise with the Australian Federal Police if he is there but if he has left for other destinations we will liaise with Interpol to arrest him. " Allegations have simmered for eight years that Ms Shaaribuu, 28, was murdered to keep her quiet about purported kickbacks to high-level Malaysian officials. According to court testimony, Ms Shaaribuu begged for her life and that of her unborn child before she was shot twice in the head, wrapped in C4 plastic explosives and blown up. Her remains were found in a patch of jungle in Kuala Lumpur's suburbs on October 19, 2006. No motive for the murder has been established in court. "Why was my daughter killed?," Ms Shaaribuu's father Setev Shaaribuu asked after a Federal Court panel on Tuesday upheld a 2009 sentence for Sirul and former Malaysian chief inspector Azilah Hadri to hang. "Until today, I do not know why she was killed," Mr Shaaribuu told the Malaysiakini online news service from Ulanbataar through his lawyer. The government has refused to hold an inquiry into the case. Mr Shaaribuu confirmed that he will now proceed with a civil suit against the Malaysian government over the murder of his daughter, who was a lover of Ferrari-driving businessman Abdul Razak Baginda, a friend and policy adviser to Mr Najib. The case centres on Malaysia's US$2 billion purchase of two French-Spanish-built Scorpene submarines in 2002 when Mr Najib was defence minister. Ms Shaaribuu spoke several languages and worked as a translator in the latter stages of deal negotiations. Mr Najib strongly denies ever meeting Ms Shaaribuu or having any link with her and the government denies any wrongdoing in the submarine purchases. But French investigating magistrates in Paris are looking into so-called "commission" payments totalling about US$160 million to companies reportedly set-up by Mr Baginda, who was initially charged with abetting a murder. The charge was dropped in 2008 before any evidence was heard against him in court. He is believed to be now living in Britain. Ms Shaaribuu, who had been married to a popular Mongolian singer, admitted in a letter found after her murder she had been blackmailing Mr Baginda, who had jilted her after they travelled through Asia and Europe together. She allegedly wanted a US$500,000 cut to remain silent about her knowledge of the submarine deal. Ms Shaaribuu was abducted outside Mr Baginda's house where she was said to be causing a scene. Both Azilah and Sirul denied any involvement in the murder. Pleading with a court not to execute him in 2009, Sirul described himself as a "black sheep that has to be sacrificed" to protect unnamed people. "I have no reason to cause hurt, what's more to take a life in such a cruel manner ... I appeal to the court, which has the powers to determine if I live or die, not to sentence me so as to fulfil others' plans for me." No motive for the murder of Ms Shaaribuu, who has two sons, was established in court. The Federal Court panel of five judges said on Tuesday the two policemen had both separately led investigators to the site where the body was found, which "strengthened" the case against them. A shocked-looking Azilah was led out of the courtroom after the decision. Sirul's defence team, however, told the court they did not know his whereabouts. An arrest warrant was issued. Azilah and Sirul were sentenced to hang in 2009 but released when an appeals court overturned the conviction in 2013 after raising questions about how their trial was conducted, prompting the prosecution's appeal to the Federal Court. Cynthia Gabriel, who runs a Malaysian anti-corruption NGO, welcomed the court decision but said too many questions remain unanswered. "For truth-seeking Malaysians, they want to know the motive for her brutal death and if anyone high up in the political leadership was also involved in the murder," she said. Mr Shaaribuu expressed concern that Sirul is missing. "I hope the police can find him soon, only then will justice for my beloved daughter be truly served," he said. The only avenue of appeal left for Azilah and Sirul is to the state sultan for a pardon to commute their death sentence to imprisonment. Comment is being sought from the Australian government's Attorney-General's Department which handles extradition requests from foreign governments. Ulaanbaatar, January 16 (MONTSAME) The Minister of Foreign Affairs Mr L.Purevsuren handed the Honorary Medal of Labour to the head of "Council of Mongolians" NGO Mr N.Nomun-Erdene on January 14. The award was in high recognition of the latter's good deeds towards the Mongolian citizens who live, work and study abroad. The Minister congratulated on the establishment of such a Council which is attended by the voluntary associations of Mongolians overseas, and promised a cooperation with this organization in frames of expanding the state policies for our citizens working and studying in foreign countries, of promoting their children to inherit the mother language, culture and traditions, facilitating the Mongolians who changed their citizenship with a favorable legal environment to return home, and of mobilizing Mongolia's "soft power". He also emphasized the contributions of Mongolians overseas in the overcoming of economic declines faced by the country during the transition period. Mr Purevsuren suggested the guests to seek the opportunities to register the council as a mandated international organization, and wished them success. After this, the Minister received the representatives of "Tsakhim Ortoo" (Online Stations) NGO, was sounded with their activities and exchanged opinions on the possibilities to implement state responsibilities through the organizations of Mongolian citizens abroad. January 15 (Surviving Mesothelioma) Mongolia has recorded its first-ever case of mesothelioma, but researchers say it is not likely to be the last. An article in the International Journal of Occupational and Environmental Health details the case of a 47-year old woman who developed mesothelioma after working for 28 years in a coal-burning thermal power plant. As in other parts of the world, asbestos has been widely used in Mongolian thermal power plants as an insulating material. Based on the prevalence of asbestos at these power plants, and the fact that more than 80 percent of mesothelioma cases worldwide have a history of asbestos exposure, the researchers recommend that Mongolia prepare for a significant rise in the disease. "We expect additional cases of mesothelioma, as well as other asbestos-related diseases, will be identified in the future," writes occupational hygienist Dr. Naransukh Damiran with the School of Public Health in the Health Sciences University of Mongolia. Damiran and his colleagues say Mongolia should set up an asbestos disease registry to keep track of mesothelioma cases. A recent study on worldwide mesothelioma rates found that too many countries were ignoring the risk and not tracking the disease at all. In the U.S., where around 2,500 cases of mesothelioma are diagnosed each year, the nation's more than 50,000 power plants have been a significant source of asbestos exposure. Because of its heat- and fire-resistance, plants often used asbestos insulation around pipes and to form gaskets in the generators, turbines and boilers that produce electricity. Even power plant floors and ceilings were often made of asbestos-containing materials to help make them more fire-proof. Any time any of these asbestos-containing parts had to be repaired or modified, the dust created a mesothelioma risk. Although power plants haven't used these materials in new buildings or equipment in the U.S. since the 1970s, many plants still contain old asbestos. Workers now have to wear protective gear when working in asbestos-containing areas of power plants in order to minimize the risk of mesothelioma. Unfortunately, these worker protections came too late for many power plant employees, some of whom developed mesothelioma decades after their exposure. Power plants are still high on the list of industries whose workers are most likely to develop mesothelioma. In the U.S., the construction and shipbuilding industries and the Navy have also produced a disproportionate number of mesothelioma victims. Pleural mesothelioma is a fast-growing cancer of the lining around the lungs. It is the most common form of mesothelioma, but the disease can also affect the abdominal lining and the membrane surrounding the heart. January 16 (infomongolia.com) On January 15, 2015, Mongolian National University of Education (MNUE) and the American Center for Mongolian Studies (ACMS) have signed a Memorandum of Understanding on cooperation to develop an academic partnership and support education inked by the MNUE Rector Dr. Davaasuren MUNKHJARGAL and the ACMS Director Marc Tasse. - The MNUE and academic institutions of the United States to exchange research programs and scholarships for researchers as well as expanding cooperation opportunities. - The MNUE and the US research institutes to collaborate as a bridge to promote education in Mongolia. - To partner with American educational institutions and researchers on education-related projects and programs. - Cooperation related to the development of the MNUE library service and its staff skill improvement trainings. A critically acclaimed choir of underprivileged children are taking their songs of hope and self-esteem to Malaysian stages. January 16 (The Star Online) They captivated the Mongolian public with their heavenly voices and stunning talent when they began performing 10 years ago. Who knew that these children – some homeless, some orphans, many of them underprivileged – had such musical flair? But they are gifted, and the Children of the Blue Sky Choir have enthralled audiences from Hong Kong and Korea to India and the United Kingdom. Malaysians now have the privilege of listening to this magnificent choir. Called Rise Of Hope - From The Streets To The Skies, the choir performs in Kuala Lumpur tomorrow, and then in Penang on Jan 24. The 11 members will perform 10 songs, ranging from Mongolian compositions to contemporary tunes from around the world. The choir has received several awards over the years, including the grand prize at the International Children's Choir Festival 2007 in Korea, and Best Band/Group at the National Cultural Children's Festival in Mongolia. Founded in 2005 under the humanitarian organisation World Vision's Child Development and Protection Programme, the choir aims to bolster and elevate the children's self-esteem. "The Choir is a means by which children can discover and develop their talents and build their confidence," says Marilee Pierce Dunker, World Vision's International Ambassador for Children. "The greatest achievement in establishing the Blue Sky Choir is seeing children who were once fearful and alone in this world blossom under the love and nurture of our staff." Dunker is the second daughter of Dr Bob and Lorraine Pierce, the founders of World Vision. All the choir members are from the Light House Centre in Mongolia, established by World Vision as a home and a haven for underprivileged children. The award-winning author, conference speaker and radio personality said that the choir practices daily from Monday to Friday, and are coached by two "highly qualified music teachers who train them not only to sing but to perform together and engage audiences." "I have been to Mongolia and seen where these children came from," Dunker adds. "Many of the original choir members lived under the streets of Ulaanbaatar, where huge pipes carry hot steam to heat the city's buildings. "Today, these children shine like bright stars, singing about the joy and hope they have found through education, faith and loving nurture, and now they are blessing others with their sweet voices and songs of hope." Dunker hopes that through the Rise Of Hope concert, audiences will be heartened by their message of empowerment. "There is hope and a bright future for every child! For children in Malaysia, we want to bring this story of hope to them," she says. "Each child has his or her own struggle in whatever environment they are living in. The concert is for them as they face the challenges and overcome the obstacles in their lives." Rise Of Hope - From The Streets To The Skies is on Jan 17 at Le Quadri Hotel, Kuala Lumpur, 2pm–5pm; and at YMCA Penang, Georgetown on Jan 24, 10am–1pm. Entry is by donation (RM35). For more information, visit http://goo.gl/60UW77. January 8 (Feature Shoot) The market economy is changing Mongolia and people's lifestyle. A large part of the rural population is now moving to the cities. Transitioning from large open spaces to a city lifestyle requires enormous social adjustments. In her series Foyers (Urbains) Mongols, French photographer Lucile Chombart de Lauwe documents the changes in the Mongolian way of life by following the once rural, now urbanized population into their new way of life. The series is focused on the relationship between families and their new environments. How did you come up with the idea for this project? "I traveled to Mongolia for the first time during the summer of 2007. I was really surprised by the incredible expansion of the cities, and by the 'ger districts', which are large neighborhoods of traditional Mongolian tents, housing more than half of the urban population . I wanted to return to have a deeper look at the urban changes happening in Mongolia, especially in the winter. Winter is especially cold there and I wanted to stay with a Mongolian family and see how people live. "In 2011 I decided to go back and to photograph the settlement issues. I was always interested in quotidian life, how people live their everyday life, their work. Foyers is more about the way people build a new home, and in a larger sense, the evolution of the Mongolian society and its influences." What was the most surprising thing you encountered while being there? "In the beginning I saw a lot of surprising things, everything seemed exotic because it was different. Compared to my own culture, it was a completely different way of life. What impressed me the most was people's ability to adapt, and that is also why I am very attached to that culture. People also have a very different way of understanding consumption." Was it difficult to get access into people's homes? "I was actually really surprised by how easy it was to get access. The doors were always open for me, and that is part of the way Mongolian people relate to foreigners. Something that illustrates their attitude better, is what the grandmother of my friend always said to me: 'Thank you for making such a long trip to meet us'." What kind of work do the newcomers do? "That is a big question and a big problem of living in the city. Finding work is difficult, there isn't enough work to be found actually. As the urban population grows larger, this lack of work results in severe poverty, alcoholism and loneliness. These days, there are a lot of mines being opened by foreign investors. Working in a coal, gold or stone mine is the most common work people do." In the description of your project you say that social changes are driven by the market economy but also by the climatic catastrophes that appear more and more often. What do you mean by that? "Temperatures in this country can reach minus 60 degrees Celsius during winter. Snow storms always existed but they became more and more intense year after year. The cattle can be decimated in such extreme weather conditions. My work is also a look into the consequences of the weather changes on the long term." January 14 (ADB) The Asian Development Bank (ADB) has approved the Sustainable Forest Management to Improve Livelihood of Local Communities technical assistance project. The project will develop and implement sustainable forest management in five northeastern soums (districts) of Mongolia. The technical assistance will develop capacity for sustainable forest management in forest management line agencies from ministry to local levels; provide capacity building to community-based forest user groups, in particular women, on forest management and skills to improve their livelihood through improved value chains of forest products; and pilot technologies for processing extracted deadwood to increase climate-resilience of forest eco-systems. In June 2008, Ikh Nart Nature Reserve and Anza-Borrego Desert State Park in California became official sister parks. Dambachoibol Bold, the governor of Dalanjargal soum (district) that manages Ikh Nart, and our then-superintendent of Anza-Borrego, Mark Jorgensen, signed an official agreement that served to foster relationships between both protected areas. Through this agreement, the Anza-Borrego Foundation and some of its donors provide much-needed equipment (spotting scopes, cameras, GPS units, laptops and even motorcycles!) and uniforms to the staff of Ikh Nart Nature Reserve, while Anza-Borrego Desert State Park rangers donate their time and expertise to train the Reserve's rangers in anti-poaching and law-enforcement techniques. The sister park agreement has resulted in the development of a ranger-training program. It has also facilitated collecting GPS coordinates for archeological sites and purchasing and placing Ikh Nart Reserve boundary signs. These activities have not only resulted in increased knowledge about the Reserve's natural and cultural resources but have also helped to reduce poaching of the Reserve's large mammals, such as the argali sheep (closely related to our own desert bighorn) and Siberian ibex. Since 2008, every other year ABF has organized a small tour to Ikh Nart Reserve, led by Mark Jorgensen. After leading the trip, Mark and several other retired park rangers, active park rangers and ABF members have remained for an additional two weeks at Ikh Nart Reserve to assist the reserve staff with boundary sign placement, training, GPS point gathering and anything else with which the Reserve's staff and rangers need assistance. The Mongolians themselves determine what assistance will best meet their needs; ABF volunteers and rangers are there to help implement those requests. This photographic exhibition is to celebrate and show some of the activities at the reserve, the staff at the reserve and the beautiful country that is Mongolia. These images were taken by Mark Jorgensen, Lynn Rhodes, Steve Bier, Phillip Roullard and Denise Zuranski. In addition there are images that show how there are geographical similarities in Anza-Borrego and Ikh Nart Reserve. Photographs on this page courtesy of Mark Jorgensen, Lynn Rhodes and Phillip Roullard. Friday, January 23rd starting at 1:00 PM and ending at 2:30 PM PST. The LIFE Club at MiraCosta College's San Elijo campus presents "A Geological Tour of Mongolia." In this talk, Chris Metzler, professor of geology and oceanography, will describe his geologic field trip to Mongolia. In addition to geology, the talk will also cover aspects of the people, culture and landscapes of Mongolia. The lecture and parking are free and open to the public. The lecture will be from 1-2:30 p.m., in room 201 at the San Elijo Campus of MiraCosta College, 3333 Manchester Ave., in Cardiff, Calif., 92007. January 15 (Discovery News) Bar-headed geese flying over the Himalayan Mountains ride the peaks and valleys like the hills and dips of a roller coaster, a new study finds. The unexpected flight pattern would seem to increase their route and be stomach-churning, but it actually helps the geese to conserve more energy than if the birds were to fly steadily at a high altitude. "Bar-headed geese are heavier than most other bird species, yet their average heart rate for the journey from Mongolia to India was only 328 beats per minute, compared to values of around 450 bpm recorded in wind tunnels or on rare occasions in the wild," co-author Nyambayar Batbayar said in a press release. "Bar-headed geese have found a way to cross the world's highest land massif while remaining well within their physiological capabilities," added Batbayar, who is a researcher at the Wildlife Science and Conservation Center of Mongolia. Batbayar and colleagues used custom-designed data loggers to monitor pressure-derived altitude, body accelerations and heart rate of geese during their southern migration from their breeding grounds in Mongolia to their wintering grounds in Southeastern Tibet or India. "These indicate that, as even horizontal flapping flight is relatively expensive at higher altitudes, it is generally more efficient to reduce the overall costs of flying by seeking higher-density air at lower altitudes," co-author Robin Spivey said. The migrating geese are essentially presented with two choices. They either fly in a relatively straight line at an altitude of about five miles up, or they must hug the mountains, losing and regaining altitude with every peak and valley. The former requires increased wing flapping in very cold, thin air conditions. The geese would therefore use up a lot of energy doing this. As for just how thin the air is at such heights, the researchers mention that oxygen is about 10.5 percent of what could be breathed at sea level. At the top of Mt. Everest, oxygen content is equivalent to just 7 percent of what it is at sea level. No wonder so many people pass out trying to climb Mt. Everest, or otherwise suffer from altitude sickness. People native to this region have evolved cardiovascular adaptations that help them to cope with the extreme conditions. The roller coaster flight appears to be a cinch for geese, though. I wonder if they even enjoy the wild ride, as many people enjoy roller coasters? They are probably too focused on their destination. Bar-headed geese may be rather hefty and inelegant-looking on the ground but, as co-author Graham Scott of McMaster University said, "they are able to accomplish something that is impossible for most other birds." The findings are published in the latest issue of Science. January 13 (Metro News) Two University of Alberta students are counting on their childhood friendship and marginal knowledge of car mechanics to get them through a 10,000-mile charity car rally, spanning across the U.K, Europe and Asia. Friends since middle school, Charles Laing and Brendan Leason said they decided to compete in the legendary Mongol Charity Rally after tossing the idea around casually. "It just kind of happened one day and we registered for it," shrugged Laing, a second-year computer sciences major. While participants in the rally fundraise for the event's charity CoolEarth, the pair is also hoping to raise money for Alzheimer Society of Alberta and Northwest Territories before they depart. Along with fundraising goals, Laing and Leason said they're looking to entice a few city sponsors interested in buying ad space on their car, which is something they'll purchase in London for no more than 500 British pounds, as stipulated by the contest rules. With some knowledge of car mechanics, Laing said vehicle breakdowns are just one issue the team could face on their journey across two continents. "I mean there's nothing that can really prepare you for this. You're in the middle of nowhere and you don't have any access to tools. You pretty much have a screw driver and a wrench," he said. "We'll probably try to bring more than just a screwdriver and a wrench," Leason added. The Mongol Rally has no set route, so each team has to design their own travel itinerary, which could include traveling through Turkey, Iran and Uzbekistan. The pair plan on blogging about their adventure. Click here for more details. January 16 (Scotzine) On this week's show we go from the Mongolian desert to the soap opera at Ibrox. Host Phil Green talks to Martin Myers of Adventure Kicks as he is about to head out to Mongolia. We hear all about the Adventure Kicks initiative and why they are heading out to the Far East. Martin and regular TFW pundit Lewis Barnes also discuss the latest issues in the Scottish game from Mike Ashley offering Rangers a £10 million loan in return for security over Ibrox and Murray Park to Hamilton Accies continuing their search for a manager. We also touch on the reports that Dundee United midfielder Gary Mackay Steven is close to signing a pre-contract agreement with Celtic and we take a look at all the weekend action – predicting the scores. January 18 (UB Post) This is the last of the three articles I have written using the notes I took during my interview with His Holiness the 14th Dalai Lama in Delhi, about three weeks ago. The first article talked about the great spiritual transition taking place in Mongolia's society, whereas the second one was about happiness and the values of life. This time, it is a summary of the Dalai Lama's teachings on how one's destiny depends on his character. Some nations have a saying that goes, "Watch your thoughts, for they become words. Watch your words, for they become actions. Watch your actions, for they become habits. Watch your habits, for they become character. Watch your character, for it becomes your destiny." It seems that the Dalai Lama's thoughts are reflected in this "thought-word-action-habit-character-destiny" logical sequence. On Dorje Shugden, the Dalai Lama said, "Among the spirits, Shugden is a very controversial one. The concept, which started during the 5th Dalai Lama's era, has been around for the last 400 years. According to the 5th Dalai Lama, a Lama named Tyabu Danzan became Shugden, an evil spirit, after making the wrong prayers. The 5th Dalai Lama said that the spirit is very harmful." You have said that it was caused by the wrong prayers. Does this mean that, if one says the wrong prayers, it can bring harm to the person praying? Yes. For example, if you have accomplished good deeds, and pray that you are now to become a holy and kind soul, it is wrong. Such prayers are very harmful. At one time, I myself worshipped that spirit, due to my ignorance. By doing so, I, the 14th Dalai Lama, disgraced the previous Dalai Lamas. The 5th Dalai Lama warned specifically about such prayers and this spirit being very harmful. The 13th Dalai Lama also put a lot of restrictions on such prayers. My junior tutor fought this spirit very much. But he treated it as a servant and as a friend, like a protector. So I also followed him. But my senior tutor was quite suspicious of this spirit. He always remained distant. So, from 1951 to 1970, I worshipped that spirit and then gradually developed some suspicion as well. Then I did thorough research on the history of the last 400 years and it became very clear that this is a very harmful prayer. Another thing is, the First Dalai Lama, the 5thDalai Lama, and the 13th Dalai Lama also worshipped in a more non-sectarian way. Many well-known great spiritual teachers were also non-sectarian. There were some individual sectarian teachers as well. This also suggests the extent of the worship of this spirit today. Once you worship this spirit, you should not keep any of your own traditions. If you keep them, this will bring you harm. So this is very bad for the promotion of non-sectarian religion. There were too many sects in the past in Tibet and, sometimes, it would lead to small-scale conflict and fighting within the religion; like Shia-Sunni mini fighting. Tibetans sometimes also fought because of extreme sectarian religion, which was extremely wrong. Gelu, Nemu, Saja, and Guhju are all followers of the Nalahru tradition; they all are followers of Buddha. Therefore, this spirit is very harmful to a non-sectarian way of worship. In Mongolia, people try to stand out and show off their material wealth rather than being humble. Humility is not that big of a trend. But, it looks like Tibetan lamas and Indian people are very humble people. How important is modesty? How do you manage to keep such an attitude when thousands of people are praying to you because you are the Dalai Lama? How do you see yourself as just an ordinary person? Your Holiness, what is your opinion on education for all ages? I always read in your interviews that you are always concerned about education and knowledge. Education is not only for children, but also for people of all ages. Please tell us what you think about this. I think that education means gaining deeper knowledge. In the 13th century, a Tibetan Gerhd Master said that humans learn continuously throughout their lives, until their very last day. Does education mean enlightenment? How does one achieve enlightenment? Are education and enlightenment different? Enlightenment can be interpreted in many ways. Of course, the better education one has, the more enlightened he is. We can say that. You can also say that scientists are more enlightened. On a spiritual level, we can say the Buddha is an enlightened person. Enlightenment is knowledge at a very deep level. Buddhism is taught to Tibetan people in the Tibetan language. Tibetan people learn Buddhism in their own language, which is not the case in Mongolia. Ordinary people don't understand Tibetan. Do you think that it is better for Buddhism to be taught in Mongolian to Mongolian people? Yes, the language barrier. I think that it is better to translate the Buddhist teachings into Mongolian. For more than fifteen years, we have been working on Ganjuur Tenjuur's more than three hundred volumes. We categorized it in three parts, upon their basis: science, philosophy, and religion. Science is common and universal. Ganjuur Tenjuur has a lot of explanations about our mind and about our body. So, we already have one textbook, which is the first part on science, with full cooperation from some scientists and some educators. We are now working on developing a draft curriculum, which can fit in the secular education field. In America, some scientists have already been carrying out experimental projects with very good results for the last 10 years. Today, Tibetan refugee schools in India are teaching lessons about Buddhist science. As Mongolia is a Buddhist country, you could easily adopt such academic teachings. Regardless of whether the student is a believer or a non-believer, Buddhism, as a secular subject, can be taught universally. It can be taught to develop inner peace. It will also make people understand that the destruction of inner peace is not an external force, but your own destructive emotion. So in order to tackle this destructive emotion, one should have better knowledge about the nature of different kinds of emotions. Then you can deal more effectively with negative emotions. This is not something for the next life, or for Nirvana. It is simply about how to maintain a healthy body, a healthy mind, a happy family, and a happy humanity. My last question, your Holiness, is what would be your message to Mongolians? I always say to the Tibetan Buddhists, Chinese Buddhists, Japanese Buddhists, Korean Buddhists, Mongolian Buddhists, and so on, that we should be 21st century Buddhists. This means that we should carry the Buddhist faith with fuller knowledge of the whole system, not just blind faith. Traditionally, many people just had blind faith. Not necessarily Buddhism, just faith. I think that this is out-dated. Therefore, in the 21st century, we should always be studying, learning, and developing our knowledge. As the Dalai Lama, this is what I would like to tell my Mongolian brothers and sisters. The word "Dalai" is a Mongolian word. When I am asked about the meaning of the word "Dalai", I always say that it is a Mongolian word.